Cyan Worlds has made the unexpected announcement that Myst Online: Uru Live is alive once again. It's the videogame that would not die. 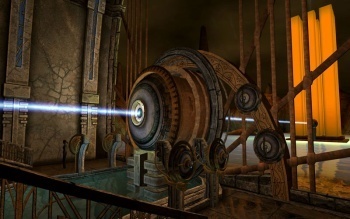 In 2003, Cyan Worlds and Ubisoft released Uru: Ages Beyond Myst, a Myst with a twist: It was set in the modern era and intended to feature a cooperative multiplayer component that would allow gamers to explore the various ages of Myst together. Ultimately, however, the online component didn't ship with the game and while it was planned to be launched separately as Myst Online: Uru Live, Ubisoft killed the whole thing at the last minute. Uru sold poorly as a stand-alone game and that, by all appearances, was that. But dreams die hard and both Cyan and a small core of dedicated fans were determined to make Uru Live a reality. An unofficial, player-maintained version of the online game called Until Uru turned up in 2004 and got a big boost in early 2006 when Cyan opened a single Until Uru server of its own, but real success seemed to strike in May of that year when it was announced that GameTap would launch an official version of the game, which arrived in February 2007. A year later, the plug was pulled yet again and in December 2008, Cyan decided to release the source code to the public domain, which sounded very much like it was finally washing its hands of the entire mess. But once again, the game has defied the odds: Cyan announced today that Myst Online: Uru Live is back for another try. "Everything takes longer than expected these days," the company said. "Cyan Worlds' plans are to move MO:UL to open source, and we finally have some good news. We've taken a first step and started a MO:UL server, so the Ages of Uru are available again. We've opened all the Ages, and added most of the goodies in MO:UL. We're referring to it as MO:ULagain - feel free to explore and enjoy." The new Myst Online is free to play, but Cyan is accepting donations to help offset the cost of keeping the game alive. "Five or ten bucks would go a long way toward helping pay the server and people bills. (No promises, but we're trying to figure out a way to show our appreciation to supporters by giving you a little something extra in MO:ULagain. )," the studio said. "But don't feel obligated - we're just glad to have the cavern open once again." I thoroughly enjoyed Uru: Ages Beyond Myst and I've always felt a bit of regret that I was never able to try the online component; hopefully the game will be able to make a real go of it this time around. More information about the remarkably durable world of Myst Online and how to jump in and start playing yourself is available at mystonline.com.